For a springtime stew, this classic Mediterranean lamb braise is perfect. Tart with lots of lemon juice and enriched with egg yolks, it’s especially good with succulent young lamb. For optimal flavor, it’s best to make the stew the night before. Most gourmet food shops and Italian delis sell fregola, a large couscous-like pasta from Sardinia. 1.Position a rack in the middle of the oven and heat to 400 degrees. Season lamb pieces generously with salt and pepper. Put 2 tablespoons olive oil in a large Dutch oven or heavy-bottom soup pot over medium-high heat and brown the lamb lightly on each side. (Do this in batches so as not to crowd the pan.) Remove browned lamb from pan and set aside. 2.Lower heat to medium, then add onions and cook until soft, allowing them to brown a bit, about 8 to 10 minutes. Add the garlic, flour, tomato paste and saffron, if using, and stir to coat the onions. Stir in wine and broth, then bring to a simmer. Add the browned lamb pieces, thyme, rosemary and bay leaf. 3.Cover pot and place on the middle rack of the oven. Bake for 15 minutes, then lower heat to 350 degrees and cook for an additional hour. The meat should be meltingly tender when pierced with a paring knife or skewer. 4.Remove lamb pieces with a slotted spoon. Strain cooking liquid through a fine-mesh sieve, then return lamb pieces and strained liquid to the pot. Taste and adjust seasoning. Cool to room temperature, then cover pot and refrigerate overnight; this makes removing the fat easier and improves the flavor. 5.Remove the stew from the fridge and remove congealed fat. Place pot over medium heat and bring to a bare simmer. 6.Bring a large pot of generously salted water to a boil. Cook fregola until al dente, about 8 to 9 minutes, drain and put into a large serving bowl. Season with salt and pepper to taste, and drizzle with olive oil. Keep warm. 8.Transfer stew to a serving dish. Mix together parsley, celery heart leaves and lemon zest, and sprinkle abundantly over the stew. Garnish with peeled and halved hard-cooked eggs. Serve with fregola and, if desired, vegetables such as spring carrots, turnips, asparagus or peas. How to make the most of star ingredients such as rib-eye and tuna? Just bring on the spice rub, rustle up a salad and add a dollop of mayo. PLACE THE WHOLE spices in a dry frying pan over a medium heat. Toast for about 1-2 minutes, occasionally shaking the pan, until they become fragrant and start to jump in the pan. Remove from pan and allow to cool. GRIND THE TOASTED SPICES using a mortar and pestle. Add the paprika, allspice and nutmeg and stir through. Rub the spice mix into the steaks along with some salt and leave for at least an hour. HEAT A BARBECUE or chargrill to medium hot. Oil both sides of the steaks. Grill the meat for about 5 minutes. Turn the steaks over and cook for a further 4 minutes. Take off the grill and allow to rest for a few minutes. CUT MEAT OFF THE BONE. Slice into 5 or 6 pieces, then place on plates in each steak’s original shape. Serve with a sprinkle of salt, a drizzle of extra virgin olive oil and a wedge of lemon. FOR THE EGGPLANT, cut into 1cm slices. Salt well and leave for 1 hour. Wash and pat dry. BLANCH, PEEL AND deseed tomatoes. Cut into 1cm dice. HEAT HALF THE OIL in a large frying pan and fry half the eggplant slices to a deep golden brown, taking care not to burn. Remove from pan and drain on paper towel to remove excess oil. Repeat with remaining oil and eggplant. When eggplant is cool enough to handle, roughly chop into 1cm pieces. Add parsley leaves to pan and fry very quickly until crisp (stand back, as it will spit). Remove and add to eggplant. REDUCE HEAT, THEN ADD garlic and cumin to pan. Cook for 2 minutes then add tomatoes. Cook for another 2 minutes then put eggplant and parsley back into pan. Cook for 1 minute, then remove from heat. Add a dash of extra virgin olive oil, lemon juice to taste and a grind of pepper. Check seasoning. Allow to cool. FOR THE MAYONNAISE, whisk all the ingredients together and finish with some lemon juice, to taste. DICE THE TUNA into ½-1cm pieces. Just before serving, season with extra virgin olive oil, lemon juice, salt and pepper. SHARE EGGPLANT salad across four plates. Top with tuna then dollop a spoonful of cumin mayonnaise and drizzle roasted chilli oil around each dish. Garnish with finely chopped chives and serve immediately. Baharat is the Arabic word for spices and the blend differs across each region of the Middle East. The mixture can be rubbed onto meat or seafood, mixed with olive oil and lemon juice to form a marinade or added to soups and sauces. Add chilli if you like it hot. Serve rib-eye with a simple side of tabbouleh and steamed couscous or slice for lunch wraps with hummus and salad. Make sure you source a well-rounded and flavoursome chilli oil to finish the tuna dish. For the walnuts: Place 1 cup walnut pieces in dry skillet over medium heat. Cook until toasted, stirring frequently. Remove from heat and cool. Chop until fine; set aside. For the fish: Trim fish and cut into portions. Melt butter in large skillet over medium heat. Place fish pieces into pan and sauté, turning half way during cooking process, and basting with butter in pan approximately 10 minutes, or until fish is no longer opaque and cooked through. Remove from pan and drain on plate. Brush fish fillets generously with bean puree and top with toasted walnuts. For the Great Northern Bean Puree: Combine beans, lemon zest and juice, salt, olive oil and cream in blender and puree until smooth. With motor running, gradually add chicken stock. Adjust seasoning to taste. For the pasta: Mound the flour in the center of a large wooden cutting board. Make a well in the middle of the flour, add eggs and egg yolk. Using a fork, beat together the eggs and begin to incorporate the flour starting with the inner rim of the well. As you incorporate the eggs, keep pushing the flour up to retain the well shape. The dough will come together in loose mass when about half of the flour is incorporated. Start kneading the dough with both hands, primarily using the palms of your hands, and incorporate remaining flour. Form dough into a ball adding a little water as necessary; dough should be elastic and a little sticky. Pour olive oil in a medium size bowl and coat sides. Place dough in bowl, cover with a dish towel, and set aside for 20 minutes to rest at room temperature. Section the dough into approximately 8 pieces and roll each section with rolling pin to approximately ¼-inch thickness. Using a pasta roller (in my case a KitchenAid mixer pasta roller) begin feeding dough through machine, adjusting thickness as appropriate. The final feed should be at the number 3 setting. Dust flattened sheets with a little flour and carefully roll by hand into a log form. Using a sharp knife, cut roll into fettuccine sized width. Unroll and separate individual noodles. Add uncooked noodles to rapidly boiling salted water and cook 1 to 3 minutes, depending on the size of your pasta. For the sauce: Slice prosciutto into slices and fry in small skillet until crispy. Set aside for garnish. In large skillet, heat olive oil. Add peppers, onions, salt and pepper; sauté 5 minutes. Add sausage to pepper mixture, stirring frequently in order to break sausage into small pieces, until browned approximately 10 minutes. Add 2 tablespoons fresh basil, skhug, and stir to combine and simmer 10 minutes. Add heavy cream and mascarpone, stirring to thoroughly incorporate. Add cooked pasta, stirring to coat pasta with sauce. To plate: Place a generous portion of pasta and sauce in center of plate, swirling pasta. Top with monkfish fillet that has been brushed with bean puree and topped with toasted walnuts. Drizzle with olive oil and garnish with crunchy prosciutto and basil chiffonade. Kale pesto, roast pumpkin, celeriac remoulade, roasted radicchio with olive oil are easy to make and will have you looking forward to lunchtime. Pumpkins are in season and people are arguing over when it’s OK to start wearing tights (call us crazy, but surely when your legs are cold?). It’s official, then: welcome, season of mists, Puffa jackets, and a new range of delicious veg. Surely, we can’t be the only impulse shoppers to buy a massive bag of kale at the weekend, only to find it at the back of the fridge, forgotten, on Thursday? • Save your on-the-edge kale by making pesto: blanch in boiling water, drain and pat dry. Remove any tough stalks. Blitz with olive oil, sea salt, pepper, a handful of skinned nuts (optional), and a chunk of hard cheese, such as parmesan or mature cheddar. Add more oil as needed, season to taste. We sometimes add anchovies. Refrigerate until needed. Mix through warm, cooked pasta for a speedy lunch. Upgrade a shop-bought sandwich or soup with a dollop – it’s great in minestrone. • Pumpkins tend to end up as soup or filled with tealights but, as with most veg, they benefit from roasting. Cut a small pumpkin into 2-3cm wedges. Lay on a foil-lined baking tray. Drizzle with olive oil, sea salt, a good grinding of pepper, a pinch of chilli flakes, and any other spices you fancy adding – try fennel, cumin or caraway seeds. Roast at 200C/400F/gas mark 6 until tender and caramelised. Chop into chunks, then mix with a drained tin of chickpeas, adding the roasting juices. To make a dressing, add 1 tbsp tahini, the juice of half a lemon, 1 crushed garlic clove and a pinch of sea salt to a small jam jar and shake to combine. Pour over your pumpkin and chickpea salad at lunchtime. A squirt of chilli sauce would also be good. • Our favourite thing to make with celeriac is remoulade. Peel and cut a small celeriac into thin batons – or use a julienne peeler. Combine with around 2 tbsp creme fraiche, the juice of ½ lemon and 2 tsp dijon mustard, season to taste. Spread on a lightly toasted bagel and drape with smoked salmon for a dreamy seasonal sandwich. Leftover remoulade is delicious for lunch or dinner with a hot, buttered baked potato. • Bitter leaves are beautifully wintry but, well, a bit too salady for when it’s nippy out. A roasted radicchio open sandwich is mellower and much more filling. Cut a head of radicchio in half and lay on a small foil-lined baking tray. Drizzle with olive oil, a little balsamic vinegar, season, then roast at 180C/350F/gas mark 4 until tender. Transfer to a plastic container, shave over some parmesan, then eat at lunch on top of a couple of slices of toast. Remember that medium heat is best, and as an extra hedge against peaches overcooking and turning mushy, choose fruit that’s a day or two away from being perfectly ripe. 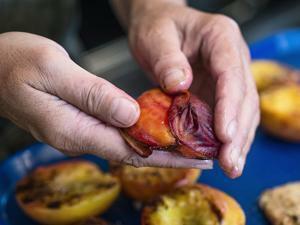 Tip: Skin slips from grilled peach halves effortlessly. Just use your fingers to push it off the flesh. – In a large bowl, mix ‚ cup salt, sugar, and 6 cups water, stirring to dissolve the salt and sugar. Submerge the chicken, cover, and refrigerate for 1 hour. Rinse the chicken and dry well. – Meanwhile, in a large bowl, whisk the vinegar, lemon juice, garlic, olives, basil, ½ teaspoon salt, and black pepper to taste. Vigorously whisk in 6 tablespoons olive oil (you should have about ¾ cup dressing). Taste and adjust the seasoning with salt and black pepper if necessary. Set aside. – In a medium bowl, toss the bell pepper planks with 1½ tablespoons olive oil and sprinkle with salt and black pepper. Brush the chicken breasts on both sides with 1½ tablespoons olive oil and sprinkle generously with black pepper. Clean and oil the grill grate with the neutral oil and grill the bell pepper planks, turning as necessary, and the chicken, undisturbed, until peppers are grill-marked and tender and chicken is grill-marked and cooked through (155 to 160 degrees on an instant-read thermometer), 8 to 10 minutes, turning the chicken once (do not overcook). Remove the peppers and chicken from the grill and set aside to rest. – (If using gas, adjust burners to medium and grill with the lid closed.) Brush the peach halves on both sides with the remaining olive oil and grill, cut side down, until grill-marked, 3 to 4 minutes. Turn and grill the second side for about 2 minutes; remove the peaches from the grill. When cool, remove the skin if desired. Cut the peppers, chicken, and peaches into slices. Whisk the dressing in the large bowl to re-blend, pour half of it into another container, and set aside. Add the salad greens, peppers, and parsley and scallion greens mixture to the bowl, toss to coat, and arrange in a bed on a large serving platter. Arrange the chicken and peaches on the greens, drizzle with the remaining dressing, and serve at once. Fried rice can broadly be divided into two categories – embellished leftovers and a main event. For rice-based packed lunches, an office microwave is ideal. If your office is unadorned with such technological riches, refrigerate your lunch, but take it out a little while before you eat, so it has time to come to a more palatable temperature. Food safety is key, so as soon as you have cooked your rice dish at home, refrigerate it as quickly as possible. • Make a batch of simple, veggie paella the night before. Sweat some chopped onion, red and yellow pepper, and pierced cherry tomatoes in olive oil, then add paella rice along with a glug of sherry, a pinch of saffron soaked in warm water, turmeric, smoked paprika and hot veggie stock. Put a lid on and simmer until cooked. Pack along with a lemon wedge and some parsley. • Kedgeree is delicious, but there is a time and a place for it. Fishy rice is best kept away from colleagues for the sake of your career prospects. Eggeree, however, is acceptable (probably): soak rinsed basmati rice in warm water for 30 minutes while you slowly fry a thinly sliced onion with a cinnamon stick and green cardamom seeds in lots of butter or ghee. Add the rice, followed by chilli powder and turmeric, then cover with chicken stock. Put a lid on and leave to simmer until the rice is cooked. Chill, then pack with a couple of chopped boiled eggs and parsley. • Though a founder-member of the yellow/beige food group (see also jacket potatoes and pies), egg fried rice can easily be given a fresh twist with the addition of spring veg. For one portion, finely chop one garlic clove and three spring onions. Wash and dry a small bunch of watercress, ripping off leaves, and chopping thick stems into small bits. Slice half a bunch of asparagus into small, bitesize pieces. 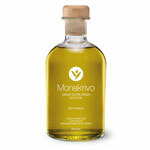 Add ½ tbsp olive oil to a wok or large pan on a medium-high heat. Add garlic and spring onion and fry for a minute, until just starting to colour, then add the watercress stalks and asparagus. Cook for another couple of minutes, stirring occasionally. When just about cooked and bright green, add the watercress leaves, one tbsp of tamari, ½ tsp grated ginger, and 70g cooked brown rice. Cook until heated all the way through, then crack in an egg and stir furiously, scrambling, until completely cooked. • For a super-speedy, fiery takeaway, go Korean and add 75g kimchi to your rice. Buy it from Asian supermarkets, online from websites such as souschef.co.uk, or make your own. Squeeze out as much juice from the kimchi as you can into a bowl, then roughly chop the cabbage. Add a glug of soy sauce and a teeny bit of chilli and sesame oil to the juice. Heat ½ tbsp vegetable oil to a wok or large pan on a medium-high heat. Add the kimchi and 1 grated carrot, then fry for 2 minutes, until the veg begins to colour. Add 70g cooked rice and continue to fry, stirring. When all is well mixed, add the juice mix. Fry until piping hot. Reheat at lunch time, or eat at room temperature, spooned into little gem leaves and topped with sliced cucumber and some shredded chicken. 1. Put the water in a bowl, stir in the yeast and sugar, and let sit until frothy, about 10 minutes. 2. Add the salt, olive oil and 2 1/2 cups of flour, and mix until the dough pulls away from the sides of the bowl. Turn out onto a lightly floured surface. Knead until smooth, about 8 minutes, adding up to 1/2 cup more flour if the dough seems too wet. Put the dough into a well-oiled bowl and cover with a damp cloth. Set aside to rise until doubled, about 1 hour. Turn the dough out onto a work surface and knead in the garlic and basil. Put it back in the bowl, cover with a damp cloth and let rise until doubled, about 1 hour. 1. Put the egg yolks, mustard, chopped garlic and anchovies into a blender. Blend until smooth. With the motor running, pour in the oil in a slow, steady stream, then pour in the lime juice and blend until emulsified, about 1 minute. Scrape the dressing into a bowl, cover and refrigerate until you need it. It will keep for about 3 days. 1. While the dough rises, preheat the oven to 250°F. 2. Put the chopped tomato on a small rimmed baking sheet and toss with 2 tablespoons of olive oil, the black pepper and the sugar. Bake until the tomato pieces have dried, about 1 hour. 3. Put the remaining 1/2 cup olive oil in a small bowl. Add the minced garlic and microwave for 30 seconds. 4. Preheat a gas grill to high. 5. Punch down the dough and divide in half. Shape each half into a ball and pat down on a lightly floured surface. Use your fingers to stretch the dough into 10-inch oblongs; it’s nice if you leave a slightly thicker rim. 6. Turn half the grill down to medium. Brush 1 piece of dough with the garlic oil and place it, oiled side down, on the high-heat side of the grill. The dough will begin to puff almost immediately. When the bottom crust has lightly browned, use two spatulas to turn the dough over onto the medium-heat side. Working quickly, brush the garlic oil over the crust and then brush with half of the tomato sauce. Scatter with half of the roasted chopped tomatoes, half of the black olives and half of the roasted red peppers. Sprinkle with 1 cup of the mozzarella and half of the basil. Close the lid and cook the pizza until the cheese melts. Remove the pizza from the grill and set it aside while you prepare the second pizza with the remaining ingredients. 7. Toss the arugula, romaine and some of the Caesar dressing together. Cut the pizzas in half, pile the salad on top and serve right away. Meat and vegetables, topped with mashed potatoes, would be just fine for a leisurely weekend. Heat 1 tbsp olive oil in a saucepan and sauté the onions, add garlic and carrots. Then add rosemary, celery, green peas, season and sauté over medium heat for 2-3 minutes. Mix refined flour with minced meat thoroughly. Heat the rest of the olive oil in a separate pan. Add the mince, chopped thyme and cook until brown. Prevent mince sticking to the bottom of the pan and stir the meat regularly to ensure there are no lumps of meat clinging together and it cooks evenly. Drain off extra fat oozed out of lamb while cooking. Now add the tomato puree and the cooked mince to the pan of sautéed carrots and peas, cook for another minute and add the red wine. Cook for about 10-12 minutes or till the wine is reduced to a little less than half of original quantity. Add the stock. Simmer over gentle heat for 20-25 minutes or until the meat is cooked and the mince mixture is thick. Spoon the mixture into an ovenproof serving dish. Boil potatoes in salted water till soft and cooked. Drain and let them be under a lid and allow them to dry in their own steam. Mash through a masher or sieve when still hot and add the butter and egg yolks, parmesan (reserve a spoonful) into the potatoes and mix well. Season well. Smear or pipe the mashed potato over the meat in a decorative manner (of your choice), sprinkle with the remaining parmesan. Bake for 20 minutes or till the top is golden and crisp. Drizzle some olive oil on top and serve with a crusty bread and salad. Look for smallish squash or pumpkins for this dish. Queen squash or Italian Delica pumpkins are perfect in shape and texture. Preheat the oven to 220C/425F/Gas7. Place the bulgur wheat in a large bowl. Pour in boiling water from the kettle, until it comes 1cm above the line of the bulgur wheat. Cover with cling film and set aside while the squash bakes. Place the squash on a baking tray cut-side up and season with salt. Drizzle with oil and bake for 20 minutes. Combine the honey, caraway seeds, orange zest and 1 tbsp of oil in a small bowl. Spoon over the squash and return to the oven for 10 to 15 minutes, or until the flesh is soft and golden. Make a dressing with the remaining 1 tbsp of olive oil, the orange juice, lemon juice, garlic and chilli. Season with salt and stir through the bulgur wheat. Fold through the herbs, spring onion and feta. Pile into the hollow squash and return to the oven for 5 to 10 minutes, to lightly toast the top. Serve with a dollop of yoghurt on the side and a little sprinkle of paprika and olive oil. From feta with spinach and blood orange to baked dal and sweet potato – you won’t miss your meat with these inspired dishes. The oven has been busy this week – baking spiced aubergines, trays of roast vegetables with eggs and a layered dish of dal and sweet potatoes. There have been frying pans of peppers and wheat on the hob, and sesame-coated cheese for bright citrus salads. It was only as we ladled out the last of the layers of baked dal onto our plates that I realised the kitchen hasn’t seen a joint of meat all week. Toast the sesame seeds in a dry, shallow pan till golden then remove from the heat. Brush the honey on the surface of the feta then place the cheese flat side down in the sesame seeds and press gently. Turn the cheese over, brush the surface generously with honey then turn and pat down gently to cover with seeds. Place the sesame-covered cheese on a piece of tin foil then place in a baking dish. Bake for 10 minutes until the cheese has started to soften. While the cheese bakes, remove the peel from two of the oranges with a very sharp knife, then cut them into thickish slices, about six per fruit. Squeeze the remaining orange into a bowl, and add the olive oil, vinegar, a little salt and some black pepper, coarsely ground, and then the sliced oranges. Wash the spinach and dry in a salad spinner, then toss with the orange slices and their dressing. Divide the spinach and orange slices between two plates, then spoon over some of the orange and olive oil dressing. Cut the warm feta in half, and place one piece on each plate.